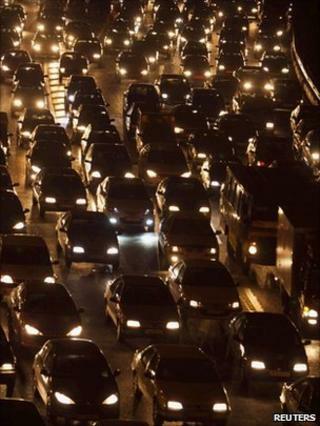 Bright city lights exacerbate air pollution, according to a study by US scientists. Their research indicates that the glare thrown up into the sky interferes with chemical reactions. These reactions would normally help clean the air during the night of the fumes emitted by motor cars and factories during the day. The study was presented at the American Geophysical Union meeting in San Francisco. All those people going about their business in a city put a complex cocktail of chemicals into the air. From the tailpipes of cars to the chimneys of factories, it makes for a heady mix of molecules that nature then has to try to clean up. Nature uses a special form of nitrogen oxide, called the nitrate radical, to break down chemicals that would otherwise go on to form the smog and ozone that can make city air such an irritant on the chest. This cleansing normally occurs in the hours of darkness because the radical is destroyed by sunlight; it only shows up at night. But new measurements taken from aircraft over Los Angeles indicate the energy from all the night-time light thrown out by this huge urban centre is also suppressing the radical. The lights may be 10,000 times dimmer than the Sun, but the effect is still significant. "Our first results indicate that city lights can slow down the night-time cleansing by up to 7% and they can also increase the starting chemicals for ozone pollution the next day by up to 5%," said Harald Stark from the US National Oceanic and Atmospheric Administration (Noaa). "More work needs to be done to really quantify the next step which would be how much ozone could we actually have the next day. This work would be important to undertake because many cities are close to their regulatory limits in terms of ozone levels, so even a small effect such as this could be important." The major types of lighting in Los Angeles are high-pressure sodium lights and metal halide lights. But switching to different types would have limited effect, Dr Stark believes. The radical is less affected by red light, but the Noaa scientist doubts authorities would want to bathe the cityscape in red light. One approach that might help would be to follow the guidelines advocated by "dark skies" campaigners who want lights pointed to the ground to stop the glare smearing out stars. "[This effect] is more important up in the air than it is directly on the ground so if you manage to keep the light pointing downward and not reflected back up into sky, into the higher parts of the air, then you would certainly have a much smaller effect of this," Dr Stark told BBC News.